The Intel® Core™ i5-600, i3-500 desktop processor series and Intel® Pentium® desktop processor 6000 series are the next generation of 64-bit, multi-core processors built on 32-nanometer process technology. Based on the low-power/high-performance Intel® ...micro-architecture, the processor is designed for a two-chip platform, instead of the traditional three-chip platforms (processor, (G)MCH, and ICH). The two-chip platform consists of a processor and Platform Controller Hub (PCH) and enables higher performance, easier validation, and improved x-y footprint. The Intel® 5 Series Chipset components for desktop and Intel® 3400 Series Chipset components for workstations are the PCH. The processor is designed for desktop and workstation platforms. This document provides DC electrical specifications, signal integrity, differential signaling specifications, pinout and signal definitions, interface functional descriptions, and additional feature information pertinent to the implementation and operation of the processor on its respective platform. Intel® Pentium® desktop processor 6000 series may be referred to as “processor”. Note: Throughout this document, the Intel® Core™ i5-600 desktop processor series refers to the Intel® Core™ i5-680, i5-670, i5-661, i5-660, i5-655K, and i5-650 processors. Note: Throughout this document, the Intel® Core™ i3-500 desktop processor series refers to the Intel® Core™ i3-560, i3-550, i3-540, and i3-530 processors. Note: Throughout this document, the Intel® 5 Series Chipset Platform Controller Hub may also be referred to as “PCH”. 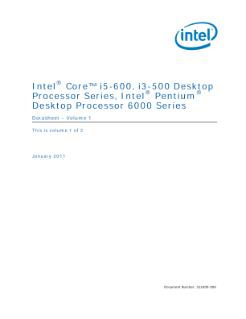 Note: Throughout this document, the Intel® Pentium® desktop processor 6000 series refers to the Intel® Pentium® processor G6950 and G6960 processors Note: Some processor features are not available on all platforms. Refer to the processor specification update for details. Read the full Processor Series Datasheet, Vol. 1.